She was the face of the mid-80s and she has a voice of velvet - Sade caused minor heart-murmurs amongst red-bloodied males and females the world over when she soothed her way across the nation's airwaves in 1984 with "Your Love Is King", with subsequent singles and albums also maintaining her reputation as a soul and jazz diva (without being too much of a diva). Her most recent album, 2010's "Soldier Of Love", surprised a few critics by racing to number one in no less than 14 different global album-charts - not here though, our public were too busy buying X Factor and Ringtone n Bass albums by vocally-challenged pretenders (possibly). 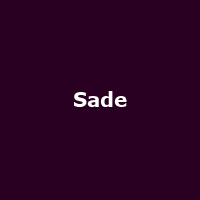 After 17 years absence from our touring roster, Sade is back with an announcement that she will grace a few regional stages starting with Dublin on 25th May 2011 and continuing to Manchester (27th), Birmingham (29th) and finally London's O2 Arena on the 31st. Tickets go on sale on Monday 18th October at 9am for the UK dates and Thursday 21st October for the Dublin date - they're not cheap at £55 / €54.80 + fees, but it has been 17 years after all.